The markets continued their climb last week for the 3rd straight week. The S&P 500 gained 2.54%, the Dow Jones Industrial Average gained 2.40%, the Nasdaq Composite gained 3.45%, and the Russell 2000 gained 4.83%. All 11 S&P 500 sectors finished higher with industrials, real estate, consumer discretionary, energy, and information technology outperforming the broader market. Many market participants have characterized the recent rally to be a technical rally from a deeply oversold condition that developed at the end of last year. The market, however, has also benefited from improved investor sentiment that has been lifted by a stronger than expected December employment report, the assurance from Fed Chair Powell that the Fed will be patient with its policy approach, and reports that recent U.S.-China trade talks went well. Those developments have convinced investors to buy the intraday dips and have made the market resilient to any selling efforts. 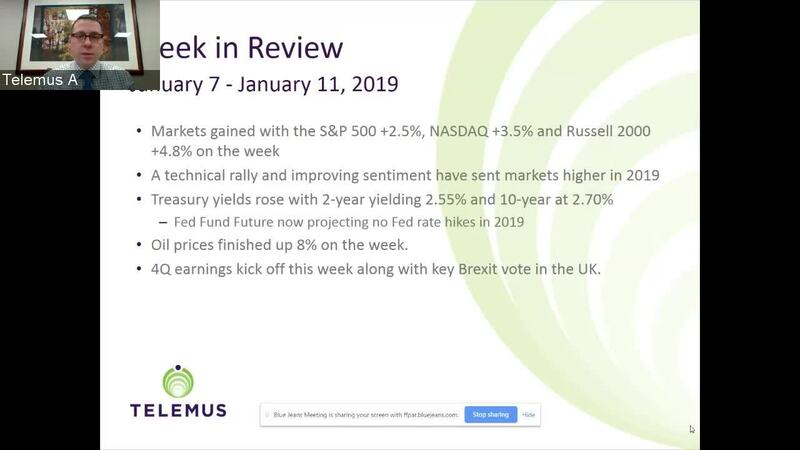 Interestingly last week's gains were made in the face of earnings warnings from Macy's, American Airlines, Apple supplier Skyworks Solutions, and Samsung Electronics. Investors saw some room for trade optimism last week when a scheduled two day trade meeting in Beijing extended into a third day. In addition, China's Vice Premier Liu He is reportedly expected to visit Washington for further trade talks at the end of the month. The fourth quarter earnings reporting period will get its official start this week and will be closely watched by investors to see if the market got ahead of itself with concerns about an earnings slowdown in 2019. Additionally, there will be a key Brexit vote in the UK Parliament and continued attention to the partial government shutdown in the U.S., which is about to become the longest on record. On the interest rate front last week, the Federal Reserve released its minutes from its December policy meeting. The minutes revealed a view that the path of U.S. monetary policy is "less clear" than before, and a contention that the Fed can "afford to be patient" about future rate hikes. In light of more recent remarks from many Fed officials discussing a more patient minded approach, including Fed Chair Powell, the view communicated in the minutes wasn't altogether surprising. Still, it is this rhetoric from the Fed that is contributing to the fed funds futures market's belief that there won't be another rate hike in 2019. U.S. Treasuries lost ground amid the gain in stock prices, pushing yields higher across the curve last week. The 2 year yield increased seven basis points to 2.55%, and the 10 year yield increased four basis points to 2.70%. In other markets the U.S. Dollar Index lost 0.5% to 95.68, and WTI crude rose 7.8% to $51.68 a barrel.